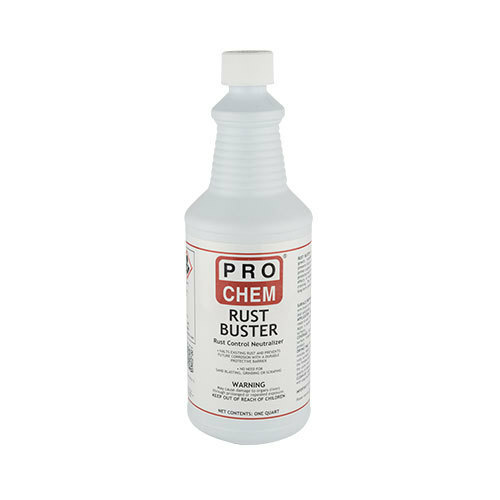 RUST BUSTER | Pro Chem, Inc.
RUST BUSTER is a water-based solution containing penetrants and a polymeric barrier coating that chemically neutralizes rust into a neutral, organic protective coating. Dried RUST BUSTER is an excellent primer for all types of industrial and automotive topcoats. This product is less toxic than most latex paints, and may be used safely indoors or outdoors. It converts iron oxide into a black protective coating that seals out moisture and prevents further corrosion. This tough primer extends paint life up to five times longer than normal. Shake or stir well. Remove large rust and scale particles with a wire brush or sandpaper. Clean the surface thoroughly to remove dirt, dust and grease. Use on dry or damp rusted metal surfaces. Do not apply if surface temperature is below 50°F. Apply a coating using a brush or roller or by dipping. Use soap and water for clean up. Dries to a tack free finish in 20 minutes, after which a 2nd coat can be applied. One gallon will treat up to 300 sq feet or 500 sq feet per gallon on smooth non-porous surfaces. Let cure for 48 hours before ready to apply oil-based paint. Note: This product will not withstand freezing temperatures or temperatures above 100°F. Do not use with water-based paints.